Meet Repeat the Beat, our latest sneak peek! Now try saying that three times in a row! Pete, as he is affectionately known, is a full-blooded Tennessee Walking Horse although you wouldn’t guess based on his love of jumping! After a career in the high-stepping Tennessee Walking Horse show circuit Pete now competes in Jumpers, Three-Day Eventing, and Handy Hunter Field tests. Pete has been recognized in various horse publications and local Tennessee newspapers and he’s considered the mascot of the University of Kentucky Eventing Team. Pete has built a huge following as the little horse ‘who can’. He’s only 15.1, but is proof that you shouldn’t judge a book (or a horse) by its cover. Pete will be making his Breyer debut as a Store Special at BreyerFest 2017 Gateway to India. 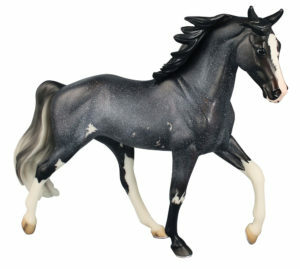 Pete is a black sabino roan on the Bluegrass Bandit mold (# 585) which was sculpted by Kathleen Moody and Sommer Prosser and introduced in 2008. Pete has 3 high white legs and unusual knee marking as well as a belly spot and a blaze. Make sure you buy your model early as this handsome guy is sure to go jumping off the shelves!